From our Surrey funeral home, E Finch & Sons Funeral Directors in Blackwater, Camberley, is honoured to serve the local community. In your time of need we are here for you, ready to organise a final farewell for your loved one. We understand that life with those you love is both unique and personal, and we believe that a funeral should reflect this. That is why we tailor each and every service to meet the individual wishes of the family. If you decide that a traditional-style funeral is the way you want to remember your loved one, we will arrange it so that every detail is as requested. The same can be said for a more contemporary service, such as a woodland burial, which can be as distinctive or as colourful as you want. Whether it is a religious or a humanist funeral, your needs are what count. You will also receive our full support at this difficult time, as the team at our Camberley funeral directors offers guidance and advice, helping to ease any of the concerns you may have regarding the funeral and the decisions that need to be made. E Finch & Sons has been providing funeral services since 1857, with the values of our founder and the commitment to those he served still guiding us today. This allows us to provide the absolute highest standard of quality funeral care, while continuing to treat each and every family that comes to us with dignity and respect. Our Camberley funeral home is located on Bell Lane in Blackwater and we are not only easily accessible to all of the town, but also to those in surrounding Surrey, Hampshire and Berskhire. These include Crowthorne, Frimley and Yateley. 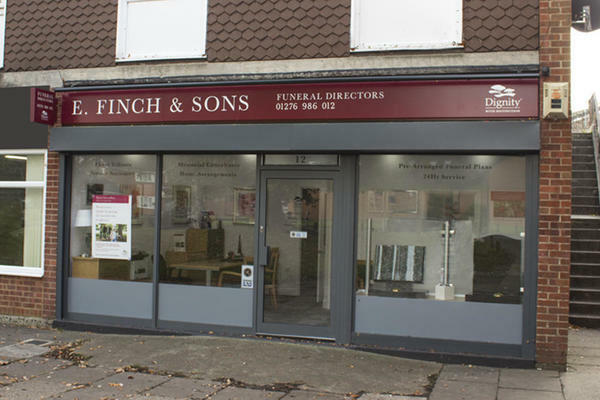 If you are looking for a dignified and personal funeral, E Finch & Sons Funeral Directors can help. Available to listen and talk, 24 hours, call us today. Call us today on 01276 986012 to talk through your personal requirements. There is parking available at the front of our funeral home on Bell Lane. We are on the small shopping parade opposite the Bell Lane side of St Barnabus Church. Our staff are available 24 hours a day on 01276 986012 if you require our services outside of these hours.